Mario games up to now had been known as jumping games. However, in this latest Mario, the main theme is gravity. There are stages in the shape of a sphere, and it's set in space. Just hearing about all this, one's head would probably be filled with question marks. 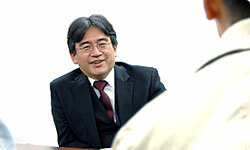 What were your impressions when you first heard about the plans for Super Mario Galaxy? I was very positive about it from the start. The concept of a spherical playing field had been around since the unveiling of the GameCube in the year 2000, and I always thought that this was a concept that we should take on some day. At that early stage, did you already have an idea of the advantages of a game with a spherical playing field? I knew that it looked very new. But at the same time, I thought that if this was to be incorporated into a jump-based platform game, it would be a very bad match. I did however think that this mismatch could be resolved if we were able to introduce a new way to play using the spherical field. So that is how the spin action was born. 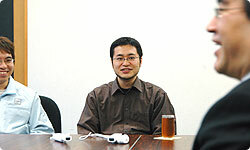 Shimizu-san, what did you think as the programmer? I think that is a natural reaction. I think when people first hear about it, they would doubt how much a spherical playing field can actually make a game more fun. For me, I felt that we would not be able to make this for technical reasons as well. I had worked on Jungle Beat before this, and seeing how we had such a difficult time making that game, which was in 2D, I was not able to see how in the world we were going to make a "Super 3D" game like this, which is another step ahead of conventional 3D games. And when the plan was approved, I knew that the programming part was going to come to me, so I felt a real sense of danger! Seeing as you were so negative about it, when was it that your impression towards the game became positive? It was only fairly recently that I felt that we were on to something. Throughout most of the development, I had been programming all day and never had a chance to actually play the game. Then towards the end of the development process, I started playing Super Mario Galaxy from the beginning, partly as a means to debug the game. As I was playing, the experience felt totally fresh. I thought to myself, “I'm playing a game like nothing that’s come before it”. Feelings like that are extremely important. 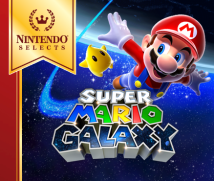 In this day and age where surprises in games are becoming few and far between, you feel like you are interacting with a completely new kind of game with Super Mario Galaxy. I think there are other benefits in a spherical playing field. Shirai-san, how about you? Mario games up to now had been known as jumping games. However, in this latest Mario, the main theme is gravity. There are stages in the shape of a sphere, and it's set in space. planets in the shape of ice cream and apples floating around, and being able to run around on them. Because the game was set in space, you were able to come up with so many ideas. So for me, like with Hayashida-san, I started off on this project with a positive impression. We were coming up with all kinds of ideas which we would note down right away, and then stick them to the wall. I think another benefit that you can only get working with a spherical-shaped world is that because you are now able to look up to the stars and see all the different planets out there, you want to travel to those planets. You are also able to discover new things about those planets when you travel to the other side of them. 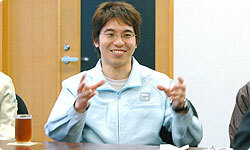 As the designer, what about you, Motokura-san? Mario shoots through space from one planet and lands on the new one like a gymnast , so the players can enjoy the adventure continuing seamlessly on the next planet. And with the design, it's really a title like no other, for instance with the way there are distinct planets floating around within a compact field of outer space. giant boss suddenly appears with a huge roar on a very small planet, I think really has a lot of impact. Being able to visualise the planet where you should be going to gives you the impression that even if you just keep running around for the time being, you'll be able to get there when you need to without getting lost. So I think even people who are not confident playing 3D platform games can still enjoy this game. Yet, I believe there were quite a few opinions from the general public who had tested the game that made you think "So we’ve only managed to get this much across to the player?" Yes. That was really the last resort! (laughs)So I had the design changed to solve some of those issues... I had the design team make it so that the players would be able to figure out what to do next by just looking at the screen. And when in doubt, use spikes!